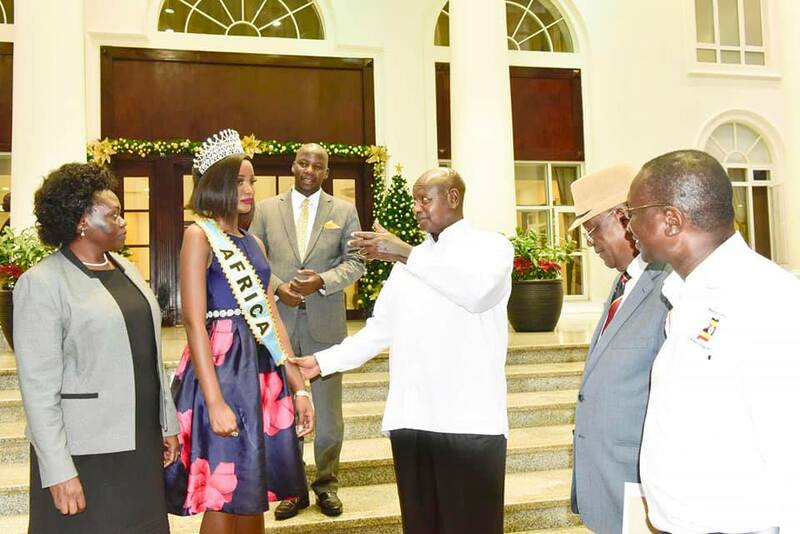 STATEHOUSE, Entebbe – President Museveni has described Quiin Abenakyo as a true definition of beauty with principles. The newly crowned Miss World Africa arrived in the country on Wednesday amid joy and happiness before she was ushered into State House Entebbe to meet the President. “I congratulate our muzukulu on these accolades and also salute her for recently completing her university degree course. She is a true definition of beauty coupled with brains,” Mr Museveni said. “She also told me she is an advocate of responsible living among young people. She is specifically focusing on helping young girls lead responsible, healthy lifestyles,” he added. The President praised Abenakyo’s parents for raising her with values. “I must commend Abenakyo’s parents for raising her with values. Many young people today rush into promiscuity and ruin their lives, yet a little patience and completing school would give them a foundation on which to enjoy the rest of their lives with their spouses,” he said. He also praised her height but mocked her hair. “Abenakyo is indeed a tall, beautiful Musoga girl. My only concern is that she was wearing Indian hair. I have encouraged her to keep her natural, African hair. We must show African beauty in its natural form.